The following is the text of William R. Staples' Documentary History of the Destruction of the Gaspee, as republished by the RI Publications Society in 1990. We are deeply indebted to Dr. Patrick T. Conley of the RI Publications Society, and to Professor Richard M. Deasy of Providence College for their consent to electronically publish this historic work along with their forward and introduction, respectively. The reprinted text was scanned and OCR recognized by PrimaPage98 into Microsoft Word97 with spell-check enabled, then converted into HTML format using Netscape Composer 5.0. As such, there is an inherent risk of OCR misinterpretation of the scanned-in text. The text from the republication of Staples also had its share of typographical errors which, when obvious, were corrected. Antique words and phraseology were maintained as best as possible, but will come up as errors in grammar checks and spell checks or modern word processing programs, so be advised. It is also to be noted that the spellings of some words used in Staples' account are consistently misspelled by year 2000 standards, but which were presumably correctly spelt in 1773, e.g., 'despatched' and 'enquiry.' Please understand that neither myself or the Gaspee Days Committee can take any responsibility for errors of omission or commission in converting the text into HTML format. To aid in scholarly research citations, we have retained the page numbers of Staples as found in the 1990 republication, but sentences and footnotes were completed into their page of origin. For clarification, the comments by Staples in the Documentary History, and by Professor Deasy in the Appendices are presented in Bold Arial font. Additionally, it was necessary to split the book into separate segments of: Forward & Introduction, Documentary History by Staples, and Appendices. And further this despondent sayeth not. In March 1772 the British armed schooner Gaspee arrived in Narragansett Bay, charged with the task of enforcing revenue laws that had long been flouted by the merchants and shippers of Rhode Island. William Dudingston, the Gaspee's commander, set about his task in earnest, and he quickly gained the enmity of those involved in the colony's thriving maritime trade. That June, while pursuing a colonial sloop sailing up the bay, the Gaspee was led into shallow water off Warwick, and there it ran aground. When news of the Gaspee's plight reached Providence, many of the town's leading citizens, seeing their opportunity, came together to plot vengeance against the hated vessel. That night a party of armed men rowed out to the Gaspee, and after wounding Dudingston and taking off the British crew, they burned the ship to the water. The British government did not underestimate the gravity of this event. In January 1773 a royal commission of inquiry convened in Rhode Island, seeking to discover the culprits so that they might be taken to England and tried for treason against the Crown. Bolstered by offers of handsome rewards for information leading to the apprehension and conviction of the guilty persons, the commission pursued its work diligently—only to be stymied at every turn by the determined, virtually unanimous opposition of the people of Rhode Island. In 1845 the distinguished Rhode Island jurist William R. Staples published a collection of documents covering the attack on the Gaspee and the British inquiry that followed. Staples' work is here reprinted, supplemented by additional documents relating to that historic episode. In an introduction to this volume—the sixth in the Rhode Island Revolutionary Heritage Series—Professor Richard M. Deasy of Providence College provides further background on the Gaspee affair and examines its significance in the context of events leading to America's coming War for Independence. No. 1. Silas Downer: Forgotten Patriot, by Carl Bridenbaugh. No. 2. The Rights of Colonies Examined, by Stephen Hopkins. Introduced and edited by Paul Campbell. No. 3. Diary of a Common Soldier in the American Revolution, 1775-1783: An Annotated Edition of the Military Journal of Jeremiah Greenman. Edited by Robert C. Bray and Paul E. Bushnell. No. 4. Rhode Islanders Record the Revolution: The Journals of William Humphrey and Zuriel Waterman. Introduced and edited by Nathaniel N. Shipton and David Swain. No. 5. Building Early American Warships: The Journal of the Rhode Island Committee for Constructing the Continental Frigates Providence and Warren, 1775-1777. Introduced by John Fitzhugh Millar. No. 6. The Doctumentary History of the Destruction of the Gaspee, by William R. Staples. Introduced and supplemented by Richard M. Deasy. In the early 1970s the Rhode Island Bicentennial Commission (ri76) invited historians to find and edit important primary sources pertaining to Rhode Island's role in the American Revolution, with the promise that such sources would be published in the commission's Rhode Island Revolutionary Heritage Series. Eight scholars responded by volunteering to edit materials ranging from manuscript diaries and journals to contemporary political pamphlets to this collection of documentary material about the Gaspee. When the commission's life expired in 1977, three volumes had been published. The others languished on our editor's shelf because the commission lacked money to get them into print. At that juncture the Rhode Island Publications Society (the successor of the Publications Committee of ri76) undertook the task of bringing the project to fruition. This volume, edited by Professor Richard Deasy of Providence College, completes that long effort. Along the way the society sought and received the cooperation and assistance of the Northern Illinois University Press, the Thirteen Colonies Press of Williamsburg, Virginia, the Rhode Island Foundation, the Rhode Island Historical Society, the Rhode Island Supreme Court Historical Society, and the Rhode Island Bicentennial of the Constitution Foundation. The six volumes of the Revolutionary Heritage Series listed on the verso of the title page are the legacy of that combined effort. It was a labor of love by editors, foundations, and presses alike, for none gained monetarily from their involvement in this historical enterprise. Professor Deasy's book is the capstone of the series. Of all the volumes, it should generate the greatest local interest, for it deals with an event in Rhode Island's history that is more celebrated than any other—the destruction of the British revenue schooner Gaspee on the evening of June 9, 1772. The Gaspee Days Observance, initiated in 1966 by David Stackhouse and others, is held annually for a two-week period in late May and early June to commemorate that famous act of defiance. Since the Gaspee raiders burned their victim as it lay stranded on Warwick's Namquit (now Gaspee) Point and came ashore in Cranston's Stillhouse Cove, the celebration has centered in the village of Pawtuxet, which straddles the Warwick-Cranston city line. It is run by a dedicated group of volunteers who style themselves the Gaspee Days Committee. Surprisingly, the city of Providence, from where most of the raiders came, has done little to involve itself in these annual festivities, but people from the entire state throng to Pawtuxet each year to celebrate the event and watch a reenactment of the burning. This book provides a solid and detailed account of the significance of this locally publicized event for those who desire to know the reason for the Gaspee Days Observance. Scholars, of course, will profit from the wealth of documentary material contained herein and from Deasy's carefully crafted introduction. Hopefully this book's availability will prompt them to reassess the significance of the Gaspee affair in the coming of the American Revolution, for despite the Gaspee's notoriety in Rhode Island, historians have tended to ignore or minimize its importance in the events leading to the war. Judge William Read Staples (1798-1868) knew well the Gaspee's significance. This learned gentleman served as an associate justice of the State Supreme Court from 1835 to 1854, and as that court's chief justice from 1854 to 1856, but it was history that was Staples' great passion. His compilation of documents pertaining to the destruction of the Gaspee, published in 1845, was one of four important historical works that he produced. Since new source material has come to light during the many years since the Documentary History was first published, Professor Deasy has undertaken the useful task of expanding and updating Staples' valuable compilation. In addition, Deasy has drawn upon his graduate research at Brown University to write an introduction to the volume that embraces the latest scholarship and offers new insights concerning the historical significance of the Gaspee affair. He places the Gaspee's role in the creation of committees of correspondence in the proper historical context, thus modifying Staples' claim that "the meeting of these commissioners . . . led to the appointment of committees of correspondence in the several colonies." Such committees, as Deasy shows, first flourished at the time of the Stamp Act crisis in 1765 and exhibited "a variety of structures" from that date onward. I feel that Staples would have been more accurate had he stated that the Gaspee investigation raised colonial apprehensions that the ancient right of trial by jury in the locality where the alleged crime was committed would be violated by a commission that might send those accused of the Gaspee's destruction to England to be tried for high treason. Such fears prompted the Virginia House of Burgesses in March 1773 to appoint a standing committee to correspond with other legislatures or their committees about activities deemed dangerous to the colonials. In a year's time all the remaining colonies, except Pennsylvania, had created agencies modeled on Virginia's. This network of official legislative committees of correspondence was novel, and the Gaspee investigation was the catalyst for their creation. Deasy also discusses the English law of high treason as it pertained both to the Gaspee incident and to that subsequent act of defiance, in December 1773, known as the Boston Tea Party. Though it was the latter that served as the direct, proximate cause for the Coercive Acts of 1774—measures that led to the call of the First Continental Congress—I have long felt that Rhode Island's defiance in June 1772 and the ensuing cover-up staged by its citizens before the royal investigating commission in 1773 also weighed heavily on the minds of those parliamentary leaders who fashioned the Coercive (or Intolerable) Acts to punish the colonists and force them to submit. In this sense, therefore, the burning of the Gaspee ended the period of calm that came with the repeal of the Townshend duties (except the tax on tea) and began the third and decisive phase of colonial opposition, which inexorably led to the War for Independence. Professor Deasy, more cautious than I (and rightly so, in view of the documentary evidence), stops short of such a claim, but he does find that England's reinstatement of the old Treason Act of Henry VIII—a measure to coerce violent protesters by prosecuting them to the limit of the law of constructive treason—"had the effect of dissolving all subsidiary arguments [for dealing with dissent], of elevating tensions to the breaking point, and of insuring one last confrontation. Differences of opinion on both sides of the Atlantic over the nature of the British Empire may have been impressive before [the Crown's response to the Gaspee], but now they had become irreconcilable within that empire." Perhaps, suggests Deasy, the epithet "First Blow for Freedom" may fit the Gaspee affair after all. Several prominent historians of the Revolutionary Era have failed even to mention the Gaspee in their recent general accounts of the coming of the war. Professor Deasy's readily available reissue and update of Judge Staples' long-neglected compilation should prevent future historians from making such an unwarranted and inexcusable omission, and it should thus reinforce Rhode Island's claim to be included with Virginia and Massachusetts in the vanguard of the movement towards independence. Over a century has passed since William Read Staples' s Destruction of the Gaspee first appeared in print, and over two centuries since that British revenue schooner ran aground and was burned in Narragansett Bay. The publishers are pleased to offer this reprinting of Staples's documents as an appropriate way to draw attention back to one of the truly significant events in the movement toward American independence. In listening to testimony, he was most diligent and careful, rarely ruling out or excluding testimony because he supposed that it might not throw light upon the question of inquiry, but always admitting any and all evidence which he supposed to be of any possible light to help elucidate the matter in dispute. 1. This work first appeared in serial form in the Providence Journal beginning March 25, 1845, and was published in the same year by Knowles, Vose, and Anthony. 2. Simplicity's Defence against Seven-Headed Policy. 3. Of Stapes's Annals of the Town of Providence, Samuel G. Arnold once said, "I cannot convey an adequate idea of the assistance derived from this work in writing the History of the State." 4. See Reuben A. Guild, "Introductory Memoir," in Rhode Island in the Continental Congress, by William R. Staples (Providence: Providence Press Company, 1870), pp. xv-xxxi. The modem reader shares this appreciation of the good judge's integrity, imagination, and industry in the collection of evidence. Staples's collection of documents on the Gaspee affair still remains the most complete and most authentic compilation ever published on the subject. Important additions have appeared in print from time to time, but all of these together do not approach one-quarter the length of Staples's volume. Staples gathered up almost all of the extant letters, proclamations, depositions, commissions, instructions, interviews, minutes, reports, reminiscences, and folklore to be found throughout Rhode Island; practically all additional documents on the subject are derivative from explorations into English archives. This work remains the primary source of every detailed treatment of the attack and its aftermath, whether cast into local or national history. It has yet to be superseded in print as the definitive documentary on the coming, the course, and the consequences of the burning of the H.M.S. Gaspee. With minor exceptions, Staples presented the documents in their chronological sequence. This arrangement still recommends itself to the reader today and permits him to follow the flow of events as a story. To facilitate the narration, Staples has supplied occasional connective explanations, but these have happily been kept to a minimum and certainly present no distraction from the participants' telling their own stories in their own words. Thus the flavor of the affair survives the passage of two centuries. The reader completely unfamiliar with this page in history may wish to start with the ballad at the very end of Staples's compilation before turning to the beginning. This will enable him to quickly overview the events of the affair down to the announcement of the royal reaction to the attack, and it will also supply the temper of the colonial reaction to these events. Such a self-assured prediction, before the inquiry had even begun, that the attackers will never be discovered will undoubtedly impress him, for this in fact is what actually came to pass. The reader may then return to the beginning of the Documentary History and read directly through to the end, confident that the substance of the Gaspee affair is before him and is found in its original flavor, pitch, and hue. 6. See John R. Barlett, ed., Records of the Colony of Rhode Island and Providence Plantations in New England, VII (Providence: A. C. Greene and Brothers, 1862), 55-192; Proceedings of the Rhode Island Historical Society, 1890-91, pp. 88-92; Samuel W. Bryant, "HMS Gaspee—The Court-Martial," Rhode Island History, XXV (July 1966), 65-72. See also Appendices A and B below. 7. Bartlett acknowledges the services of George Bancroft on his behalf in Records, VII, 57. 8. See, for example, David S. Lovejoy, Rhode Island Politics and the American Revolution, 1760-1776 (Providence: Brown University Press, 1958), pp. 158-66; Lawrence H. Gipson, The Triumphant Empire: Britain Sails into the Storm, 1770-1776, Vol. XII of The British Empire before the American Revolution (New York: Alfred A. Knopf, 1965), pp. 22-38. The initial documents (pp. 3-12) provide the immediate background of the attack. Next are given the recollections of two members of the raiding party, set down many years later (pp. 12-16). The following pages recount first the actions taken by the civil magistrates of Rhode Island immediately after the raid (pp. 17-21) and then the actions of Admiral Montagu, as well as Governor Wanton's reactions (pp. 21-37). The official response of the British Ministry appears next (pp. 37-42). The succeeding pages present the official proceedings of the first session of the court of inquiry, together with its attendant correspondence (pp. 42-83), followed by the similar material for the second session (pp. 83-96). Then minutes and forms omitted from the first session are supplied (pp. 96-101). The inquiry's final report follows (pp. 102-107), after which Staples concludes with a few of his own observations (pp. 107-110). The essentials are all here and all in order. However, some additional information on the Ministry's reaction to the attack, some comments on the final report, and a few words on Staples's observations might prove helpful, and conclusions on the lasting historical significance of the Gaspee affair may be ventured as well. Turning, then, to the opening pages of Staples' compilation (pp. 3-12), the reader finds before him the essential background for the assault upon the schooner. Here the basic conflict between the interests of the Crown and those of the colony of Rhode Island unfolds with dramatic compression. It is immediately clear that William Dudingston was not the first naval officer commissioned to enforce the revenue laws in Narragansett Bay. Nor was his style of executing his instructions particularly novel either, although there is impressive evidence that he surpassed his predecessors in heavy-handedness. It is equally clear to what lengths Rhode Islanders were willing to go to prevent this kind of revenue-law implementation. Whatever the merits of Wanton's demand for seeing the Gaspee's commissions and instructions, Dudingston obviously never satisfied it prior to the night of June 10. It also appears from Wanton's protests that the full import of the Sugar Act of 1764 was not clearly understood by him. His resentment at the stopping of small packet ships that were trading completely within the colony does suggest that he was not fully apprised that such activity came within the compass of this law, which may never have been promulgated in its entirety on this side of the Atlantic. It seems equally clear that Montagu drew no distinction between his services as an admiral in the navy and as an agent of the revenue service. He flatly rejected any obligation to submit his credentials as a revenue officer to the governor of the colony. Wanton's insistence upon such a formal presentation was apparently consistent with long-standing policy in Rhode Island. Stephen Hopkins, speaking as the colony's highest judicial officer, was very clear in ratifying this position. It is even possible that the discovery of Dudingston's customs commission among his ship's papers during the attack actually saved his life from summary execution for piracy. Later, when he was brought to trial in Warwick in July for illegal disposition of confiscated property, he was required to produce his customs commission. The paper that he presented was rejected not only because it was simply a copy but also because the original commission had not been approved by the governor. In any case, the commissioners who inquired into the ship's burning deliberately avoided judging the merits of this Rhode Island policy. Now all of this, in turn, raised a larger question. Was the inspection and approval of a customs commission by a colonial governor necessary for a revenue official to legally discharge his duties within the colony? In Rhode Island the vice-admiralty court was established under the colonial government, the power of appointment resided here, and the local judge was sworn to his office by the governor. Although the naval officers on station in North America were hardly the appointees of colonial governors, nevertheless when they acted in the capacity of revenue officers, the colonial governor's concurrent powers and the colony's own customs came to bear upon the strict legality of their operations. This situation may, indeed, have been peculiar to Rhode Island, but it manifestly provided a context for Wanton's action in this case. 10. Oliver M.Dickerson, The Navigation Acts and the American Revolution (Philadelphia: University of Pennsylvania Press, 1951), p. 179. 11. See Mary M. Marinelli, "The Investigation of the Gaspee Attack: A Reappraisal" (M.A.T. dissertation, Brown University, 1962). 12. Edward Channing, "American Board of Commissioners of Customs," Massachusetts Historical Society Proceedings, XLIII (October 1909-June 1910), 486-87. Governor Joseph Wanton. Painting in the Redwood Library, Newport. Rhode Island Historical Society, Rhi X3 1939. Under whatever construction, it is evident that Dudingston was very much aware of the danger to him personally if he set foot on land within the colony and also of the liability that he would have incurred in the local courts. In fact, he utilized this very expectation to break the law, shipping confiscated goods out of the colony while still admitting his knowledge of the statutory prohibition. In pleading such special circumstances, he clearly indicated the impasse between naval officers enforcing revenue laws and colonial officers discharging their own duties. Finally, as Staples notes, the distinction between an appointed colonial governor and one, such as Wanton, who had been elected under a charter may not have impressed Dudingston or Montagu, but it obviously underscores the position that Wanton took throughout this epistolary duel. These opening pages further disclose the Liberty episode at Newport in 1769. 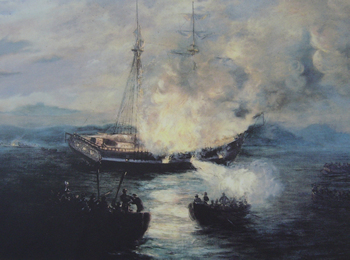 All of the essential ingredients of the Gaspee affair were present here—the reaction to Captain Reid's vigorous enforcement of the revenue laws, the firing at the commanding officer, and the burning of his ship. Indeed, the only missing ingredient was the actual wounding of the officer, apparently more attributable to poor marksmanship than to any forbearance on the part of the Newporters. In this case Wanton also offered a reward in an official proclamation and received several depositions. However, the Crown took no action: there was no formal inquiry or even any official recognition of the event. Possibly this was because of the fall of the Grafton Ministry at the time, or because the Townshend duties were in the process of repeal and it was expected that colonial disturbances would soon subside, or because the determined and persistent Admiral Montagu had not yet assumed command in North American waters. One final observation upon these pages needs to be made in any attempt to recapture the depth of Rhode Islanders' feelings against this kind of revenue enforcement. The colony was absolutely dependent upon maritime trade for its survival. This included not only oceanic traffic, especially with the West Indies, but also coasting traffic on both sides of Narragansett Bay. Any sustained, or even sporadic, interruption of this maritime trade could spell economic disaster for the colony, and the colonists perfectly understood this. 14. Bartlett, Records, VI (1861), 593-96. 15. Lovejoy, Rhode Island Politics, pp. 18-20. In fact, this very argument had already been advanced in great detail almost a decade before by Stephen Hopkins in his memorable pamphlet The Rights of Colonies Examined, [l6] Whatever one thinks of his arguments on the limits of Parliament's powers and on the rights of colonial legislatures, his case for the economic vulnerability of his native colony was fairly stated. This was a humbling stroke, very unexpected, and rendered them, not even the Admiral excepted, at the mercy of all the merchants, etc., whom they had injured—for it is probable they had all to a man, by taking fees and bribes etc., as well as by malicious seizures, etc., become liable to a loss of office—. Stiles's conclusion is very suggestive of the limitations that the commissioners later did place voluntarily upon themselves in their investigation. 16. Bartlett, Records, VI, 416-27. 17. Dickerson, Navigation Acts, pp. 208 ff. 20. The Literary Diary of Ezra Stiles (New York: Charles Scribner & Sons, 1901), I, 324. In the following pages of Staples's History (pp. 12-30), we are given actual accounts of the attack on the schooner. First the raiders, Ephraim Bowen and John Mawney, then the defenders, William Dickinson and William Dudingston, supply sufficient detail to recreate the entire episode in anyone's imagination, even at this late date. Allowing for differences in perspective, motive, and time, the essential ingredients of these different versions are all in substantial agreement. The narratives of Dickinson and Dudingston constituted the informational basis upon which the Crown acted. Except for what happened ashore just before the attack, the Crown had, therefore, all of the important facts on the assault and its aftermath that were confirmed years later. In fact, it had at the time all that we have today. These pages also present the initial actions taken by the civil authorities of the colony. Here we find the first legal definition of the attack, the first official inquiry, and the first public posting of a reward for information. The reader may judge for himself how pro forma all this was and whether the matter might have rested right there. The initiative, however, then passed to Admiral John Montagu, who began a second inquiry of his own. In these documents the reader will note that the colonial magistrates were reacting to the testimony that the admiral developed and that this in turn led to an impasse by the end of the summer. The navy referred the matter to the Crown, and the second Gaspee inquiry also came to an inconclusive end. Other impasses also emerge within these pages. Apparently Montagu had no intention of allowing his star witness Aaron Briggs to be examined aboard the H.M.S. Swan by any civil magistrates, as presumably this would have been an admission of concurrent, if not superior, civil jurisdiction. It is obvious that Wanton was admitting that the attack had taken place, but at the same time he was also insisting that the prosecution remain within the colony and its jurisdiction. The tensions between the two separate authorities were continuing. Just as Wanton moved to counter the testimony of Briggs in his letters to Montagu, so too he moved to counter the evidence of Montagu in his letter to Hillsborough. The initiative at this point had clearly passed across the Atlantic, and it was now for the Crown to weigh conflicting evidence, delimit jurisdictions, and determine what action to take on the Gaspee affair itself. Meanwhile, the admiral's reactions to those elements of the Gaspee affair that clearly lay within his own jurisdiction were immediate and energetic. Upon receiving the first news of the attack, he ordered the captains of the Arethusa, the Kingfisher, and the Swan to survey rigging, provision for three months, and hold themselves in readiness for sea. He directed Captain Linzee of the Beaver to impress as many Providence people as he needed to complete his and the Swan's ship complements. He chartered another schooner to replace the Gaspee, On June 12 he wrote to Hillsborough, apologizing for troubling him, "but the lawless and piratical people of Rhode Island obliges me to write to you.'' Enclosing Dickinson's deposition, he described Rhode Island as a "nest of daring smugglers" who wounded Dudingston and burned his ship "for no other cause except his being dilligent in the discharge of his duty ... to suppress the illicit trade that is carried on to a great degree . . . and which can never be checked unless there are more men-of-war stationed there." On the same day Montagu also wrote to Philip Stephens, secretary of the Admiralty, explaining that he had sent Dickinson's deposition to Wanton, but "as the inhabitants of Rhode Island in general are a set of lawless, piratical people, and whose whole business is that of smuggling and defrauding the king of his duties, I cannot expect any satisfaction from that letter. Clearly Montagu was pressing the matter with great urgency. On July 11 he wrote to Hillsborough again. This time he enclosed Aaron Briggs's deposition identifying Potter and the Browns as participants in the attack, adding that "It appears to me . . . that these people were the ringleaders in this piratical proceeding." He then explained that he had forwarded this information to Wanton but that "the disposition of the people of that government in general, is such, that I cannot flatter myself with much success, unless some other method is taken for apprehending them." He did not elaborate upon "some other method." 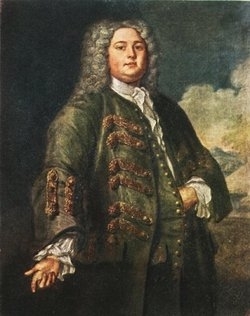 Nor was Montagu alone in advocating "some other method." Thomas Hutchinson, governor of Massachusetts, also wrote to Hillsborough on June 12, predicting that in Rhode Island "nothing will be done by authority there than issuing a proclamation and perhaps not even that." He expected so little of Wanton because "his constitution is such that he is not capable of making his own judgment and must be subordinate to the designs of the illicit traders." 21. Quotation from Montagu's journal in Samuel W. Bryant, "The Gaspee Syndrome: A Tory View" (M.A. dissertation, Brown University, 1957), p. 62. 22. Bartlett, Records, VII, 89. 23. Acts of the Privy Council of England, Colonial Series (London: Anthony Brothers, 1908), p. 523. 24. Bartlett, Records, VII, 94-95. He concluded with the opinion that "If some measures are not taken in England in consequence of so flagrant an insult upon the King's authority I fear it will encourage the neighboring colonies to persevere in their opposition to the Laws of Trade." Hutchinson's coupling of Wanton's incapacity to act with the colony's charter was apparently shared by others. Montagu later told Hutchinson that some members of the government at home would not be content with mere punishment of the culprits. Rhode Island's charter was in jeopardy if Lord Sandwich, first lord of the Admiralty, were to have his way. Montagu expected that Sandwich "will never leave pursuing the colony, until it is disfranchised." Certainly John Pownall, the American undersecretary, feared as much. He advised Lord Dartmouth, upon entering the Colonial Office, that the attorney general thought the Gaspee attack "five times the magnitude of the Stamp Act" and that the government's policy "is meant to pledge the American minister in coercive measures." Sandwich had been a coercionist since joining the North Ministry in 1771, and Lord Gower, president of the Privy Council and a Bedfordite, was also both by temperament and by past conduct most likely to support coercion. Although Rhode Island's charter was neither revised nor revoked as a result of the Gaspee attack, the colony's apprehensions on this count were well enough founded. What "other method" was adopted by the Crown is evident in the communications that appear next in the Staples documents (pp. 37-42). The decision-making process of the British Ministry is very revealing, and the reader will wish to have some additional information here. When the news of the Gaspee attack reached the Admiralty on July 15, in the form of Montagu's report of June 12 and Dickinson's deposition of the same date, copies were sent to Hillsborough, and Montagu was ordered to proceed to Rhode Island to bring the offenders to justice. More and larger vessels were to be sent there, and Montagu was authorized to offer a reward of five hundred pounds for the arrest and conviction of the criminals. 25. Gaspee Papers, Edwards Collection, Rhode Island Historical Society Library, Providence. 26. Bartlett, Records, VII, 103. 27. B. D. Bargar, Lord Dartmouth and the American Revolution (Columbia: University of South Carolina Press, 1961), pp. 76-77. 28. Bernard Donoughue, British Politics and the American Revolution (London: Macmillan, 1964), pp. 40-41. General Gage was to meet demands for this sum, and the orders were to be forwarded by a sloop-of-war as soon as possible. Despite the increase in reward, there was as yet no substantive change of policy by the Crown. On August 7 Hillsborough wrote to Wanton, warning him that the king considered "the tone of menace and insult" in the governor's March letters to Dudingston "highly disrespectful of His Majesty." He added that the governor's charge that His Majesty's officers were "unnecessarily distressing the internal and coasting trade" rested on "general assertion." He noted that the king did not consider the issuance of the governor's proclamation proof of zeal in the matter and directed Rhode Island officials to "exert themselves most actively for the discovery of the offenders.'' Hillsborough also enclosed the recently enacted Dockyards Act, which provided that any person who burned one of the king's ships should be "adjudged guilty of felony, and shall suffer death." This act stated that if this crime should be committed in any place out of the realm, the accused might be indicted and tried for the same, either in any shire or county within this realm, ... or in such island, county, or place where such offence shall have been actually committed, as his Majesty . . . may deem most expedient for bringing such offender to justice, any law, usage, or custom notwithstanding. Hillsborough then told Wanton that the attorney general and solicitor general had been asked whether under this act the persons concerned in burning the Gaspee "may be tried in England . . . and for what crime." The letter was sent before the law servants had replied to the colonial secretary. 29. Bryant, "The Gaspee Syndrome," p. 62. 30. Manuscripts of the Earl of Dartmouth (London: Eyre and Spottiswoode, 1887), II, 86 quoted in Gipson, The Triumphant Empire: 1770-1776, p.29. 31. Acts of the Privy Council, p. 523. The particulars of that atrocious proceeding have, by the King's command, been examined and considered with the greatest attention; and although there are some circumstances attending it, in regard to the robbery and plunder of the vessel, which, separately considered, might bring it within the description of an act of piracy, yet, in the obvious view of the whole transaction, and taking all the circumstances together, the offence is, in the opinion of the Law Servants of the Crown, who have consulted upon the question, of a much deeper dye, and is considered in no other light than as an act of high treason, viz. : levying war against the King. At the time of their decision the law servants had received from Hillsborough both Montagu's letter of June 12 and Wanton's of June 16. Their decision was based on a law passed in 1543-1544 (35 Henry VIII, c. 2). "It recites that doubts had arisen whether treason committed abroad could be tried in England, and enacts that such treasons shall be tried in the King's Bench or before special commissioners in any county in England." 33. Gipson, The Triumphant Empire: 1770-1776, p. 28. 34. W. E. Holdsworth, A History of English Law (Boston: Little. Brown and Company, 1924), p. 524. This "act for the trial of treasons committed out of the King's dominions" had made possible the transportation of Irish traitors by providing that any treason committed out of the realm of England might be tried at Westminster before the King's Bench or in any English county by special commissioners appointed by the king. Bradley Chapin, The American Law of Treason (Seattle: University of Washington Press, 1964), p. 10. They further observed that there were "many instances of commissioners appointed to inquire into and report the state and condition of colonies," and they recommended that a commission with authority to try and determine "ought to have the sanction of an act of assembly there, or an act of Parliament here." Hillsborough's resignation on August 14 came because of a policy disagreement over American lands west of the Line of Demarcation and had nothing to do with the Gaspee attack. In fact, after Dartmouth replaced him, there was no substantive change in the Ministry's policy toward the attackers. At the Cabinet meeting of August 20, Hillsborough's letter to Wanton of August 7 was withdrawn and canceled, but this was simply because the law servants had concluded that the Dockyards Act was inapplicable in this case. Instead, it was agreed that all the papers concerning the Gaspee attack be laid before the king. The next day the matter came before the Privy Council, and this body took action along the lines indicated in the law servants' report of August 10. It ordered the law servants to prepare a commission to investigate the Gaspee attack and to report their findings to the secretaries of state. The lawyers were also to draft the king's proclamation, offering pardon and reward to any informer except the "sheriff" and the "captain." These decisions were based upon an insufficiency of evidence for positive identification. The council decreed that when such evidence was developed, "any persons committed be surrendered by the Governor of Rhode Island to the Admiral on that station for trial in England" and, just as a precaution, that "General Gage hold himself in readiness to send a sufficient force into the province." The lawyers drafted the commission and presented it to the council, and on August 26 both the commission and the king's proclamation were approved. The council also ordered Dartmouth to prepare the letter and a warrant for passing the commission under the great seal. Thurlow believed the commissioners should be instructed under the signet and sign manual. Pownall drew up the instructions and also wrote to Wanton, telling him of Gage's orders, which letter was later signed by Dartmouth. 35. William R. Leslie, "The Gaspee Affair: A Study of Its Constitutional Significance," Mississippi Valley Historical Review, XXXIX, No. 2 (September 1952), 238-42. 36. Acts of the Privy Council, p. 525. Thus the lawyers' report to Hillsborough became the course of action of the Privy Council and was implemented in the royal proclamation, commission, and instructions that appear in these pages of the Documentary History. Late in October the local colonial press described the upcoming inquiry as a court with the powers to hear and to determine. a "commission of oyer and terminer ... to try any person .... taken in consequence of the proclamation." This article also inaccurately identified two of the commissioners. In early November the Committee of Correspondence of the Boston Town Meeting drew up a "List of Infringements and Violations of Rights," which included depriving colonials of the right of trial by jury and taking them to England for trial; in this case the Dockyards Act was linked to the Gaspee attack. Early in December the Reverend John Allen of Boston delivered a sermon in which he indicted "new Courts of Admiralty created to appoint and order the inhabitants to be confined and dragged away 300 miles from their families, from their laws, rights, and liberties to be tried by their enemies" as unprecedented "cruelty, injustice, and barbarity.'' The words of both the Boston committee and the Boston preacher were given wide dissemination in the press. By mid-December the press identified the apprehending officer of the commission as Montagu and added that transportation to England had been provided in order that "those devoted persons ... be tried for high treason." By the end of the year the press was referring to the inquiry as an "alarming star-chamber inquisition" and a "court of inquisition more horrible than that of Spain or Portugal." Its powers were described as "novel, unconstitutional, and exorbitant," and the entire procedure was assailed as '' shocking to humanity, repugnant to every dictate of reason, liberty and justice; and in which, Americans and freemen ought never to acquiesce." 37. Franklin B. Wickwire, British Subministers and Colonial America, 1763-1783 (Princeton: Princeton University Press, 1966), pp. 141-43. This was the letter referred to above (pp. xviii-xix), which later became a center of controversy itself. It apprised Wanton of the actions taken by the Privy Council and of his new responsibilities as chairman of the upcoming inquiry. Wanton placed it before the Rhode Island General Assembly, and it was soon quoted in part in the colonial press. This created a furor which, in turn, was reported back to Dartmouth by another commissioner. Dartmouth then wrote to Wanton, calling him to task for the public disclosure. The apparent reason for such excitement over this one communication seems to be that this is the only official definition of the Gaspee attack as an act of "high treason." 38. Providence Gazette, October 24, 1772; Newport Mercury, October 26, 1772. 39. Votes and Proceedings of the Boston Town Meeting, 1772, in Gipson, The Triumphant Empire: 1770-1776, p. 49. 40 John Allen, An Oration upon the Beauties of Liberty; or, The Essential Rights of Americans (Boston, 1772), pp. xiv-xxii. 41. Providence Gazette, December 19, 1772. 42. Providence Gazette, December 26, 1772. By December 31 the most damaging portions of Dartmouth's letter to Wanton had appeared in print in Massachusetts. This misinformation, misunderstanding, and misrepresentation all formed a part of the press's coverage. On the other hand, in late November both local papers had accurately presented the commission's authorization, purpose, and personnel, as well as the contents of the proclamation. On December 10 the Providence Gazette quoted the law passed in Rhode Island in 1664 to the effect "that no freeman shall be taken . . . or condemned, but by the lawful judgment of his peers, or by the law of this colony." In an editorial in the Gazette of December 26, trial in Great Britain was defined to be "in open violation of MagnaCharta." On January 9, 1773, the Gazette quoted the resolves of the Rhode Island General Assembly in 1769, which had followed those of the Virginia House of Burgesses earlier that year. They stated that all trials for treason, felony, or any crime whatsoever committed within the colony by anyone residing therein ought to be held within the colony and that the seizing and sending of any resident of the colony beyond the sea to be tried was "highly derogatory of the rights of British subjects." In other words, although the commission to investigate the incident and to report back to the Crown was mistaken for a special court with the power to hear and to determine the matter, the fact that there was to be a treason trial in England was clearly understood at the outset. It is this which accounts for the climate of suspicion, obstruction, and noncompliance in which the Gaspee inquiry found itself. The following documents in Staples (pp. 43-55) constitute the backdrop for the first session of the Gaspee inquiry. Comprising mostly correspondence among the participants of the inquiry, they can be read separately and briefly before the actual record of the first session, or they can be read in conjunction with the following pages, inserting them as their dates suggest. They reveal the continued tension between the military and the civil authorities and indicate that this tension had now spread from Montagu to the commissioners as well. 43. Providence Gazette, December 26, 1772. 44. Massachusetts Spy, December 31, 1772. 45. Providence Gazette, November 21, 1772; Newport Mercury, November 30, 1772. It is worth noting that although Briggs singled out John and Joseph Brown, Potter, and Richmond as attackers, Montagu was seeking the interrogation of Andrews, Fenner, Cole, Hitchcock, and Sabin as well. Apparently the admiral's own inquiry was still proceeding and widening as the official inquiry progressed. It is also worth noting that the commissioners' explanation to Montagu was that their inability to procure witnesses must be attributed to the winter season. It is apparent from the outset, even before any of the direct testimony is examined, that the inquiry was falling well short of its mark. The burden of the inquiry's proceedings appears in the following pages (pp. 55-77). Obviously Darius Sessions misrepresented the manner of the raiding party's assembling, interceded for key witnesses who did not appear, and discredited an important witness, Stephen Gulley. Gulley's testimony itself is very revealing, as it disclosed the existence of a "vigilance committee" operating to prevent identification of the attackers. Note also the speed with which another witness, Joseph Borden, was produced to demolish Gulley's testimony. The deposition of Patrick Earle suggests that a positive identification of the Greene that had been in the raiding party might have been made if the commissioners had pursued the matter. The absence of the key witnesses highlighted this session of the inquiry. Arthur Fenner and John Andrews pleaded ill health, and George Brown, John Cole, and Daniel Hitchcock the press of business. Hitchcock and Cole apparently collaborated on their testimony concerning events in Sabin Tavern the night of the raid. One day before, Brown, Cole, and Hitchcock had told Hopkins that they intended to refuse to appear before the commissioners, presumably on the advice they had received earlier from Sam Adams. Adams had challenged the jurisdiction of the commissioners, but Hopkins obviously convinced them to move away from this kind of direct challenge and to submit written depositions instead. Misrepresentation, intimidation, and evasion are all evident here in this first session. Staples next supplies additional testimony submitted to the commissioners by Darius Sessions (pp. 77-81). Here Sessions continued to discredit Briggs's testimony, to excuse witnesses who had been summoned, and to take depositions on his own initiative. 46. John Adams to Darius Sessions, December 28, 1772, in The Writings of Samuel Adams, ed. H. A. Cushing II (New York: G. P. Putnam & Sons, 1907), 289-92. 47. John Cole et al. to Stephen Hopkins, January 19,1773, Nicholas Brown Correspondence, John Carter Brown Library, Brown University, Providence. His self-imposed role as amicus curiae clearly influenced the course of the inquiry. The official minutes and documents of the first session are completed, slightly out of chronological order, a few pages further on (pp. 96-101). These entries form an abbreviated record of who was summoned initially, what later summonses were issued as evidence was developed, who failed to appear in person but did respond, and who failed to respond at all. They make a convenient recapitulation of the first session and a convincing study of the commissioners' frustration. The prescribed form of the oath that the commissioners took completes this section. Although not historically relevant to the outcome of the Gaspee affair, it is in itself a fascinating historical curio and a reminder of a basis of treason trials in the generation past. The commissioners' letter to Lord Dartmouth at the close of the first session (pp. 81-83) is most revealing. Much attention was devoted to explaining the altercation that had ensued between the commissioners and Montagu, more than enough to suggest that the commissioners were very concerned that the Crown be as pleased with their proceedings as with any findings. Their inability to procure witnesses was simply ascribed to inclement weather. They obviously created the expectation that in May things would be different, especially since Dudingston would be with them at that time. However, as will become evident from other sources, three of the five commissioners had already resigned themselves to ultimate failure at this point. In historical retrospect, this was the end of the road. The second session developed nothing of material significance beyond the first. The commissioners' final report could well have been written in January rather than in June, inclement weather notwithstanding. As the proceedings of the second session show (pp. 83-96), the testimony of Cole, Andrews, and Brown added little to their written statements of January. Cheever conceivably could have identified suspects actually presented to him, but this did not happen. Dickinson described in more detail the "captain," the "sheriff," and the two doctors, but nothing more was developed in any of these cases. Faulkner further discredited Briggs. Heime attributed the failure of a grand jury to be charged and to conduct an investigation simply to his own forgetfulness, certainly a singular admission. Sessions's final contribution was a reaffirmation of the original complaint against Dudingston. Dudingston himself never testified at the inquiry. Ramsdale never appeared. The court began taking evidence on June 1 and sent its findings to the Rhode Island Superior Court on June 7, less than one week later. No new witnesses had been uncovered or sent for. No new evidence had been developed. The second session had not moved the inquiry one step beyond the first. In pursuance of Article 3 of their instructions, the commissioners turned over evidence that they had collected to the deputy governor and to the Rhode Island Superior Court. It does not appear that Deputy Governor Sessions responded. Chief Justice Hopkins and his associate justices found that the depositions "do not induce a probable suspicion" and asked the commissioners if they were "of a different sentiment." The commissioners replied, "We decline giving any sentiment or opinion in the matter." The commissioners then told Dartmouth that this declination, together with "there being no probability of our procuring any further light on the subject," "determines our inquiry." In other words, the commissioners specifically refused to judge the evidence and to act upon it. In the original draft of their communication to the Superior Court, they spoke of any judgment upon the evidence as "clearly out of our department," although this reference was deleted from the final draft. The import is clear enough. It was for the Rhode Island court to judge the matter and for the Rhode Island deputy governor to act upon it. The commissioners never exceeded their original assignment to inquire into and to report back. They never became a body to hear and to determine. That was reserved for the Crown. The final report of the commissioners to the king (pp. 102-107) is a document well worth attentive scrutiny. The care taken in locating the exact place of the attack may be misleading. The correction inserting Providence in place of Newport was necessary because the royal instructions had misplaced the site of the attackers' assemblage. The precise location of the attack was of major importance for three reasons: (1) the Dockyards Act had been ruled out as inapplicable because, although it would have brought the attackers to England for trial, the exact site of the assault did not fit the delimitations of this statute; (2) the Ministry's entire policy had been posited upon the assumption that the attack had taken place within the body of the colony, otherwise the offense would have been defined as piracy; and (3) such a site fit 35 Henry VIII as without the realm but within the empire. 48. Commissioners to Stephen Hopkins et al. June 12, 1773, Gaspee Papers, Rhode Island State Archives, State House, Providence. Although the word treason never appeared in the proclamation, the commission, or the instructions, the commission did refer to Dudingston's having been "traitorously wounded." At least the report on location satisfied Crown policy. In the same vein, the commissioners carefully noted "the unforeseen event of the Gaspee running on shore, the suddenness of the undertaking and its accomplishment, and the total want of evidence of even an intention to destroy her." For a conviction in a treason trial, this might have compromised the Crown's case. On the other hand, by applying past traditions of constructive treason, the Crown might have summarily brushed these particular findings aside. In a somewhat different vein, Montagu's own inquiry was obliterated when the report rejected his star witness, Briggs, as not even remotely creditable. The most important conclusion that the report came to was unquestionably that in terms of evidence, the commissioners had already collected "all there was any probability of obtaining." This really terminated the report. However, certainly in the interest of future Crown policy, the commissioners' assigning of the "probable causes" of the attack is of cardinal importance. That one cause was "the great impatience of some people in this colony under any restraint of trade, however illicit," is undoubtedly a very realistic conclusion, although one that does not derive strictly from the evidence developed in the course of the inquiry. The second cause, "the check which your Majesty's navy officers have put to such trade by the necessary aid and assistance which they have afforded the revenue officers," presents a different consideration. Shortly before the assault upon Dudingston, revenue officials such as John Andrews and Charles Dudley had also been attacked in Rhode Island. However, seizures by customs ashore were divided three ways, with one-third going to the customs officer, one-third to the governor, and one-third to the treasury, whereas seizures afloat meant a two-way division, with one-half going to the confiscating ship and one-half to Admiral Montagu. Obviously, real tensions existed among all three interested parties. 49. Lovejoy, Rhode Island Politics, pp. 155-56. 50. Dickerson, Navigation Acts, pp. 168-70, 202. Ezra Stiles's speculations on possible disclosures of customs racketeering have been mentioned earlier, but how far such disclosures may have accounted for suppression of evidence is impossible to ascertain with any precision. Doubtlessly, they were a factor. It seems curious that the commissioners singled out the Liberty incident as a probable cause. This was the episode described by Staples in the opening pages of his Documentary History. It is not exactly true that "no inquiry was instituted," for the colonial authorities both posted a reward and took several depositions at the time. It is even true that the Privy Council took notice of the incident. It is certainly true that no further action was ever taken either in Rhode Island or in Great Britain in regard to the attack, and it has been suggested much more recently that "failure to take any steps . . . undoubtedly added to the feeling of confidence of Rhode Islanders . . . that they could threaten with impunity any of the King's ships that seriously interfered with their trade." The curiosity, therefore, lies in the commissioners' limiting their attention to the Liberty. An investigation of the St. John episode was proposed just before the commissioners adjourned, but the proposal was overridden. This episode was clearly an attempt to destroy a revenue schooner by shore fire back in 1764, an attempt that almost succeeded. There was no follow-up either in the colony or at home at the time. There were, though, still other comparable attacks in Rhode Island. 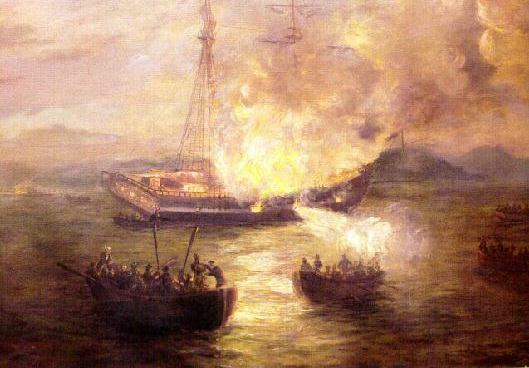 In June 1765 the boat of the Maidstone was seized and burned on the commons at Newport in retaliation for some recent impressments of Rhode Islanders. The governor referred the ship's captain to the civil courts for redress. Clearly, attacking British ships was no novelty in Rhode Island. It is equally true that an unqualified application of the British laws of constructive treason would have equally suited any one of these other assaults as well. Logically, the Gaspee attack was simply the proverbial straw that broke the camel's back. 51. Lovejoy, Rhode Island Politics, p. 157. 52. Gipson, The Triumphant Empire: 1770-1776, p. 23. 54. Actually, the Crown ordered a report, five depositions were taken, none were ever forwarded to Great Britain, and three rest quietly today in the Rhode Island State Archives. 55. At the same time, Governor Ward excoriated the ship's commander for violating the laws of the colony, in effect for trespassing, as well as for conducting an illegal impressment. Bartlett Records, VI, 446-47. One probable cause cited in the report compromises the Crown's case. Dudingston was found guilty of "an intemperate, if not a reprehensible zeal," and the commissioners concluded that he "exceeded the bounds of his duty." Yet Dudingston was never directly interrogated by them, and none of his ship's company nor Montagu nor any other captain on the North American station was directly questioned on this score. By contrast, none of the colonial civil magistrates were so pointedly and specifically accused despite their less than sparkling performance of their duties in this matter. Granted that the commissioners' protestations that "we have used our utmost care and diligence" referred to identifying attackers of the Gaspee and not to assigning probable causes for its destruction, and granted that they were doubtlessly right about Dudingston and even more so about his crew's illegal plundering along Narragansett Bay, on this point witnesses were also still available and could have been examined, but the commissioners themselves "determined against both." In one sense the most significant of all the probable causes was suggested by Hopkins's opinion that any person coming into the colony "to exercise any authority by force of arms or otherwise" must show his commission to the governor, or he was guilty of' "trespass, if not piracy.'' The commissioners declined to judge "what effect such opinion might have on the minds of the perpetrators of the crime," and they did not "presume to determine" whether Dudingston had been obliged to acquaint the governor "with his power and authority." This is the most understandable, judicious, and acceptable omission in the entire report. For the commissioners to have rendered a judgment upon this matter would have involved them in the turbulent arena of conflicting interpretations of the constitutional structure of the British Empire at that time. Nothing less was at stake here. Did the colonies enjoy a degree of independence and competency of their own, as Hopkins himself had asserted earlier in his Rights of Colonies Examined? Or did the home government possess absolute authority to bind the colonies "in all cases whatsoever," as the Declaratory Act stated? It was simply too much to expect that three chief justices, an admiralty judge, and a colonial governor should resolve such a profound and portentous dilemma. It was an issue that would not be resolved short of appeal to arms. Prepared by the commissioners as a public statement, the final report is certainly compromised by what we now know to have been the private opinions of three of them. Back in February, after the adjournment of the first session, Smythe had written to Dartmouth giving his real impressions of the inquiry. From the progress of the inquiry and from outside information, he had already concluded that the culprits would be "screened from the hand of justice." He expected this because "almost the whole power of the Crown is delegated to the people of Rhode Island," and that power "is now prostituted to the purpose of private interest" and "abject submission to popular factions." With "no effectual control being interposed" in the past, "defiance of laws and an unbounded licentiousness has at length grown to treason itself." He judged Dudingston's actions necessary to stop the growing illicit trade and his misfortune the result of hatred that had been deliberately stimulated. Although the attack was ''perpetrated at a place and in such a manner as without all doubt the actors must be known to hundreds of the inhabitants of the colony," it "is hitherto kept so secret that all our inquiry has been ineffectual to fix with certainty upon any particular person concerned in this outrage." Furthermore, "to keep the matter secret is now become a common cause." Smythe noted that the people were quiet and the magistrates cooperative, but he added that he "considered their offers of assistance as little better than a disguise to come at the knowledge of such persons as might be accused, and then to aid their escape." "No magistrate or officer of Rhode Island would ever lend a hand to commit any person," he concluded, because "there seems to be an universal abhorrence of such a proceeding" and "nothing but an armed force would effect it." Prescinded from Smythe's reference to the colonial charter, this is probably the most perceptive and penetrating analysis of the progress of the inquiry on record, and it is certainly the most realistic one in regard to its prospects. Horsmanden had reached a similar conclusion at the same time. In another letter to Dartmouth he also diagnosed the problem as derivative from the Rhode Island charter. "The government (if it deserves that name) is a downright democracy; the governor is a mere nominal one ... a cipher, without power of authority; entirely controlled by the populace." He concluded that "under these circumstances, Your Lordship will not wonder that they are in a state of anarchy." His solution was to revise the charters of both Rhode Island and Connecticut, take these colonies "more immediately under the protection of the crown," and consolidate them as "a royal government." 56. Gaspee Papers, Rhode Island Historical Society Library. 57. Bartlett, Records, VII, 182-85. Oliver, writing after the American Revolution had started, recalled that "the Commissioners' part was in the nature of a grand jury, to inquire and find a bill, and the magistrates of the colony were to send them over for trial." He concurred with Smythe that the burning of the Gaspee was treason and that "no magistrate would have been willing, much less would have dared to execute a process . . . and upon such an attempt, they would have rushed into rebellion three years before they did." He agreed with both Smythe and Horsmanden that the reason was that "this government was so republican . . . there was no protection to any magistrate, in the legal discharge of his office, contrary to the minds of the populace." With the advantage of hindsight over his two associates, Oliver concluded that if the colonials had revolted at the time, "perhaps it would have been better they had done so; they might have been less prepared for it, and a decent firmness might have more easily, and at less cost, subdued it." Whatever the private thoughts of Wanton and Auchmuty, it seems clear that three of the five judges—and this constituted a quorum—had come to conclusions very different from those stated in the final report. The suggestion here is not that such recommendations as the revision of the charter or the vigorous application of force should have been included in the final report. The commissioners were not specifically directed to submit recommendations. In any case, their thoughts on the matter had been dutifully transmitted to the Crown, which might act upon them if it chose. The import of these communications lies elsewhere. Sentiment for charter revision and the application of force was no longer confined to Montagu and Hutchinson on this side of the Atlantic. The futility of the inquiry had been recognized before the second session began, and public disclosure of these letters presumably would have directly altered the subsequent course of the inquiry. In any event, no significance need be attached to the omission of Peter Oliver's signature on the final report; Oliver concurred in it, but he could not attend the signing because he was riding circuit in Massachusetts at the time. 58. Peter Oliver, Origin and Progress of the American Rebellion, ed. D. Adair and J. A. Schutz (San Marino, Calif.: Huntington Library. 1961), p. 99. 59. Bryant, "The Gaspee Syndrome," p. 78. The British Ministry was apparently interested only in evidence against suspects leading to treason trials at home. After receiving the commissioners' final report, Dartmouth wrote back in August that the king wanted "an authentic copy of the minutes of your proceedings." Dartmouth also requested "copies of the examinations of Aaron Briggs, Patrick Earle, Peter May and William Dickinson," together with the "depositions of Samuel Tompkins, Samuel Thurston, and of Somerset and Jack"—in short, all of the evidence which the Rhode Island Superior Court had found unanimously "do[es] not induce a probable suspicion." Wanton forwarded a copy of Dartmouth's letter to Smythe, then back in New Jersey in December. Apparently nothing further emerged from this line of correspondence. The only evident follow-up was in reply to another part of Dartmouth's original letter in which he asked the commissioners to submit "an account of the expenses which have been incurred in carrying His Majesty's Royal Commission into execution." Horsmanden later wrote Governor Tryon of New York that he had not yet received reimbursement, and Smythe even later approached Dartmouth on the same matter. The tone of both of these letters indicates that the inquiry had now become a completely closed case. However, the real import of Dartmouth's letter lies elsewhere. Although Dartmouth clearly accepted the commission as having been fully executed, he still wanted the names of suspects and the evidence against them. Any subsequent determination made upon this information would hardly have reactivated the Gaspee inquiry, but it could have served as a basis for warrants being issued directly from Great Britain against any suspects. This possibility was not lost upon the wary Rhode Island magistrates. If the Crown lawyers read the evidence differently, then the Rhode Island charter might stand in jeopardy of revision. Not surprisingly, the minutes, examinations, and depositions have quietly reposed in Rhode Island ever since. The Documentary History concludes with Staples's own observations on the Gaspee affair (pp. 107-108). Staples's first assertion, that "the meeting of these commissioners . . . led to the appointment of committees of correspondence in the several colonies," has always been a popular and respectable contention. 60. Dartmouth to Commission of Inquiry, August 17, 1773, John Hay Library, Brown University, Providence. 61. Wanton to Smythe, December 16, 1773, John Hay library. 62. Dartmouth to Commission of Inquiry, August 17, 1773. 63. Horsmanden to Tryon, April 19, 1777, in Bartlett, Records, VII, 188-89. 64. Smythe to Wanton, 1779, John Hay Library. 65. See, for example, Writings of Thomas Jefferson, ed. Paul L. Ford, I (New York: G. P. Putnam & Sons, 1892), 8-9. The committees came at a time when the fires of colonial opposition to British policy were just flickering after the repeal of most of the Townshend duties. The long-range thrust of this thesis is that these committees then led to the American Revolution, or at least supplied an organization for its conduct once it had begun. It is in this sense that the Gaspee affair has been styled the "First Blow for Freedom." As a key qualification to this point of view, it should be observed that the formation of committees of correspondence was not a novel development at this juncture. These committees first flourished at the time of the Stamp Act crisis. Nor does it advance the argument to point out that there were a variety of structures exhibited in the various committees of correspondence from time to time. The differing forms that they took simply represented the patterns of colonial political organization within the separate colonies. The committees' function was always the same. Furthermore, on a local level this movement had already been successfully reestablished by November 1772 in Massachusetts. Here, as we have seen, under Sam Adams's driving direction the protest against the Gaspee inquiry was simply incorporated into a number of other grievances. These included not only the creation of a new civil list taking local offices, including judgeships, away from control by the colonial legislatures but also the release with the Hutchinson papers of a letter by Auchmuty that was very embarrassing to his judicial impartiality. It has been suggested that this entire protest already anticipated the Declaration of Independence. Unquestionably, the action of the Virginia House of Burgesses represented a widening of this local development to an intercolonial level again, but even here the enduring historical significance of the committees of correspondence has been subjected to reevaluation. When it is recalled that it was not these committees but the colonial legislatures and the Second Continental Congress that became the real revolutionary apparatus for the coming and the conduct of the war, then it may be plausibly concluded that they may not have been the Gaspee affair's most lasting legacy. 66. Proclamation of June 6, 1970, by Rhode Island Governor Frank Licht. 67. See Edward D. Collins, "Committees of Correspondence of the American Revolution," Annual Report of the American Historical Association, I (1902), 243-71. 68. Gipson, The Triumphant Empire: 1770-1776, pp. 47-50. 69. Merrill Jensen, The Founding of a Nation (New York: Oxford University Press, 1968), p. 431. Staples's second observation invites reflective consideration. When he wrote that "our surprise is not so much excited at the conclusion to which they came from the evidence before them, as at the small amount of testimony they collected," he undoubtedly recalled that the commissioners had been given sweeping powers to develop evidence by both their commission and their instructions. He could not have known of Horsmanden's regret that witnesses were not cross-examined. His comment that the commissioners "were surrounded, too, at the time of their sessions, by the officers of the crown, and individuals high in rank and standing, who were eager in the chace of those who insulted their sovereign in the person of his representative, Lieut. Dudingston," is offset by the surmises of other observers. It will be recalled that Stiles attributed the reluctance to come forward on the part of some Tories to the fear of disclosure of past customs racketeering, and that Smythe guessed that civil magistrates were so cooperative in order to learn what witnesses would be summoned so that defenses could be prepared accordingly. Stiles went further in his conjectures and suggested that outright bribery might have served to weaken the ranks of the loyalists. He wrote in his diary that "I am told . . . that for thousand guineas hush money by Providence gentlemen are supposed to have lodge in hands where the Admiral has had a feeling, and so as to keep of information from the Commissioners who are supposed to be uncorrupted [sic]." He theorized that three of the gentlemen suspected were worth up to $40,000, and that "an innocent man of wealth had rather give $1,000 sterling out of $10,000, than be arrested and transported to England for a trial for treason." If "misdemeanors and oppressions" in the customs "rendered them, not even the Admiral excepted, at the mercy of all the merchants etc., whom they had injured—for it is probable they had all to a man, by taking fees and bribes etc., as well as by malicious seizures etc. become liable to a loss of office," what of English treason trials? This fear would have accounted for both bribery and collusion, because the charge included both treason and misprision of treason, as the civil magistrates fully understood. 70. Bartlett, Records, VII, 183-84. Horsmanden also regretted that the commissioners had failed to "bring the witnesses face to face." 71. Stiles, Diary, I, 334. The charge certainly goes far to explain "the small amount of evidence." The reader will probably concur with Staples on the loyalty of the judges, particularly in view of their private correspondence that has since come to light. The only possible exception here is Wanton. Although it is unlikely that his business connections with the Browns compromised his judicial integrity, nonetheless Wanton simply did not quite fit into the same category as the other four. True, when the Revolution came, he sided with the Crown, but even this choice has been recently somewhat qualified. It might not, however, "be doing great injustice to the memories and the character" of the commissioners to suggest, as Stiles did, that the inquiry was hardly to their liking and they "were inclined to interpret it in the mildest sense." Doubtlessly Staples's most important comment still remains the common sense of the matter two centuries later: "It is passing strange, that no persons could be found, who could identify those engaged in the enterprise, or that the great reward offered on the occasion should not have induced some one to have turned informer," especially since "no great care was used to preserve secrecy." In a colony of nearly sixty thousand residents, with the protection of British men-of-war at hand, and attracted by an enormous reward and a complete pardon, "not an individual could be found who knew anything about the affair." Granted that collusion, coercion, and bribery may have accounted for part of this "passing strange" phenomenon, nevertheless the opposition to the inquiry was very deep and very widespread. Stiles predicted that "a congress had been sure, if one person had been seized and carried off from Rhode Island." Oliver told Stiles that "the uneasiness of the people was so great against him that he had been obliged to declare in his charges to the grand juries the real powers of this Rhode Island Commission." Richard Henry Lee wrote to John Dickinson that "much alarm has been created by a new court of criminal jurisdiction, it is said, having lately opened in Rhode Island. " Earlier protests had already indicated profound resentment against the revenue laws, the manner of enforcing them, and impressment. 73. Elmer E. Comwell, "The Ordeal of Governor Joseph Wanton," Rhode Islander (Providence Sunday Journal magazine), June 9, 1974, pp. 32-39. 74. Stiles, Diary, I. 349. 77. The Letters of Richard Henry Lee, ed. James C. Ballagh, I (New York: Macmillan, 1911), 83-84. In light of the Crown policies that led to the attack or those that were adopted because of it, the "great silence" was still the most amazing feature of the Gaspee affair. One final observation upon Staples's conclusions is in order. Not only among the raiders "were some, little conscious of the crime they were committing and the penalty they were incurring," but also other colonists were equally in the dark, and for good reasons. It will be recalled that Lord Hillsborough had initially led Governor Wanton to expect that prosecutions would be based upon the Dockyards Act. It had never been explicitly stated that the Treason Act of Henry VIII had later been substituted as the applicable law. This fact alone accounts for the widespread misunderstanding that the attackers were going to be prosecuted on the basis of a law that had not yet been promulgated on this side of the ocean at the time of the attack. Stiles, Sam Adams, and the colonial press all reflected this misconception, although Adams perceived that the Dockyards Act was a sequel to the Resolves of 1769 and argued for the right of trial by jury in the vicinage with precedents all the way back to Magna Charta. Secondly, the authority and powers of the Gaspee inquiry were revealed piecemeal, and its legitimate competence and procedure were never fully understood throughout the colonies. Over a year after its final report had been rendered, committees of correspondence were still seeking the inquiry's true nature and power, protesting "the uncertain medium of the press." Finally, and most importantly, the charge of high treason was revealed only in Dartmouth's letter to Wanton; in the words of Stiles, "no one justifies the burning of the Gaspee, but no one ever thought of such a thing as being treason." Dartmouth was indignant over the public disclosure of this letter, which presumably revealed the real basis of Crown policy. It is not clear that the charge of treason dramatically changed the nature of colonial resistance to the inquiry, but it certainly put it into a very different context. From one point of view, the most revealing document of all has been supplied by Staples at the end of his compilation. This ballad may not completely represent the consensus of the colony, but it surely reflects the mind of its maritime residents. 78. Adams, Writings, II, 367. 79. Bartlett, Records, VII, 238. 80. Stiles, Diary, I, 349. The assertion that the king will have the raiders "tried a new fashion" refers to press reports of a court to hear and determine, a court with the military at its disposal, with jurisdiction that would supersede that of existing courts, with personnel suggesting Crown interests, and with power to send suspects to England for trial. That it was to be a treason trial is evident from the king's determination that "those men shall surely die." Attacking, plundering, and destroying His Majesty's Schooner Gaspee were all punishable by fine or imprisonment or both, but levying war against the king had to be punished by execution, and in its most barbarous mode—by hanging, drawing, and quartering. For this reason the balladeer confidently anticipated the course of history: "I'm apt to think he never will" find "those hearts of gold" that "burnt her up." Glancing back over these pages of Gaspee documents, we may conclude that all of the essentials are right here. The arrival of the revenue sloop triggered a running battle with the colonial authorities reminiscent of earlier struggles over still unresolved grievances; a turn of the tide invited an unrehearsed and hastily prepared night attack upon the armed ship as skillfully conceived as it was successfully executed; and the "great silence" of magistrate, merchant, and mariner alike completely frustrated the royal wrath and all of the engines of empire in the attempt to uncover state's witnesses. The memorable affair has been well recounted by generations of Rhode Islanders, all using Staples's compilation. Yet one is reluctant to leave Staples without a final thought on the broader and continuing historical significance of the events which he permanently recorded with his priceless documentation. The decision of the Ministry in August to try the attackers of the Gaspee in England for treason must be viewed in the light of earlier developments in the continuing dispute between the Crown and the colonies. It will be recalled that after the conclusion of the Great War for Empire in 1763, Britain initiated an ambitious imperial reorganization which affected colonial life in a variety of ways. The changes ranged from new taxes to new regulations, and thirteen of the North American colonies replied with spirited resistance. 81. See Samuel G. Arnold, History of the State of Rhode Island and Providence Plantations (Providence: Preston and Rounds, 1899), II, 311-20; Edward Field, ed., State of Rhode Island and Providence Plantations at the End of the Century: A History (Boston: Mason Publishing Company, 1902), III, 80 ff. ; Thomas W. Bicknell, The History of the State of Rhode Island and Providence Plantations (New York: American Historical Society, 1920), I ,652-97 passim; Lovejoy, Rhode Island Politics, pp. 158-66. Britain regarded this resistance as criminal, whereas America saw it as constitutional. These differences, probably irreconcilable from the start, broadened and deepened over the next thirteen years. From the outset, a body of laws existed which described aggravated riots and even verbal resistance as treason, but what was not clear at the outset was whether England would evoke her common-law interpretation of constructive treason to smash colonial resistance to her new policies. A major component in this imperial reorganization was the Stamp Act of 1765, but extensive colonial opposition effected its repeal the following year. This repeal was coupled with the Declaratory Act, which was a blanket assertion of unqualified supremacy of the home government over its colonies "in all cases whatsoever." Both the manner of changing laws of the realm and the declaratory law itself then became part of the evolving British Constitution and its interpretation. A resolution accompanying the Declaratory Act described the activities in America as "tumults and insurrections." In the debate in the House of Lords, it was asserted that pamphlets had "led the people to rebellion." Colonial claims of a distinction between internal and external taxes were described as "criminal and treasonable." Up to this point, however, these allegations reflected individual opinions and not public policy. In 1767 the colonists again reacted against Crown policy, this time opposing the Townshend duties and the remodeling of the customs service. In Massachusetts in 1768 the Circular Letter, Liberty riot, and September Convention highlighted this resistance. That September, Secretary of War William Barrington wrote to Governor Francis Bernard saying that no pacification would be possible "unless some legal examples be made of persons concerned in the late violences committed there." Early in November, Lord Hillsborough sent papers describing affairs in Boston to Attorney General William DeGrey and Solicitor General John Dunning, asking them if these actions were criminal. The lawyers replied that the trials of Americans in England had to be based on 35 Henry VIII, c. 2, which provided that any treason committed out of the realm of England might be tried at Westminster before the King's Bench or in any English county by special commissioners appointed by the king. 82. Chapin, American Law of Treason, p. 10. 83. T. C. Hansard, ed., The Parliamentary History of England (London, 1813), XVI, 161. 85. Bowdoin and Temple Papers, Series 6, IX, 83; Chapin, American Law of Treason, p. 12. 86. Edward Channing, ed., The Barrington-Bernard Correspondence and Illustrative Matter, (Cambridge: Harvard University Press, 1912), p. 166; Chapin, American Law of Treason, p. 13. 87. Chapin, American Law of Treason, p. 13; cf. p. xix above. However, they gave their opinion that the actions described in the papers did not amount to treason. Rebuffed by the law servants, the Ministry then turned to Parliament. George III told the opening session in 1768 that Boston appeared "to be in a state of disobedience to all law and government." On December 15 Hillsborough presented and moved in the House of Lords the adoption of eight resolutions condemning the activities in Boston and describing some town meeting actions as "calculated to excite sedition and insurrection" and the Massachusetts assembly as an "audacious usurpation of the powers of government." The duke of Bedford then read an address to the king, petitioning him to direct your Governor of Massachusetts Bay to take the most effectual methods for procuring the fullest information that can be obtained touching all treasons, or misprisions of treason and to transmit the same together with the names of persons who were most active in the commission of such offences to one of your principal secretaries of state, in order that your Majesty may issue a special commission for inquiring of, hearing, and determining, the said offences within this realm pursuant to the provisions of the statute of the 35th year of the reign of King Henry, the Eight. This course of action was being recommended "either for the maintenance of your Majesty's authority in the said provinces, or for guarding your Majesty's subjects therein from being further deluded by the acts of wicked and designing men." The Lords approved both the resolutions and the address and sent them to the lower house for concurrence. There then ensued another "great debate," at least as portentous as the one over repealing the Stamp Act. Against the Bedford Resolution, it was argued that "the act of 35th of Henry 8, is for treasons committed out of the realm, and the 25th of Edward 3, makes levying war within the realm treason; so that whether America is in or out of the realm, it cannot be within the letter of both these acts." 88. Chapin, American Law of Treason, p. 14; cf. p. xix above. 89. Hansard, Parliamentary History, XVI, 466-70; Chapin, American Law of Treason, p. 14. 90. Hansard, Parliamentary History, XVI, 466-70. 91. John Wright, ed.. Cavendish's Debates, I (Ridgway, 1839), 185-87. 93. Chapin, American Law of Treason, p. 14. 94. Wright, Cavendish's Debates, I, 190-225. In retort, it was replied that the Americans "carried with them the 25th of Edward the Third, and shall they not carry with them the 35th of Henry the Eight?" Against the resolution, it was asked whether "it was calculated to give those privileges to Englishmen, which the present application of it would deprive the Americans of? ... How can they avail themselves of the right to challenge jurymen[?] . . . How are they to avail themselves of counsel? ... By what process are they to compel the appearance of witnesses from the other side of the Atlantic?" In reply, it was pointed out that under this treason law those accused of treasons committed on the Isle of Man, at Calais, and in Ireland had been brought to trial in England, so "why then should it not extend to our colonies, and why should they complain of it as a matter of hardship?" The opposition asserted: "By your resolution you suppose and presume treason, at the same time that you acknowledge you have no proof." The defense rejoined: "If any overt act of treason had been actually proved ... we should have sent over for the individuals who were guilty." The critics claimed that this old law was being evoked "because you cannot trust a jury of that country." The supporters agreed to "partake in the sorrow that has been expressed at the fact, that there is no jury in America which can be trusted." Against the measure, it was advanced that "in truth, you do not mean to send for any body and this resolution is so much waste paper." In support, the answer was that "it was not meant to put the act in execution, but only to show to America, what government could do if pushed to it." Many of the opposition arguments went uncontested. Edmund Burke, for example, argued that approval of the Ministry's plan meant acquiescence in past mistakes and "approbation of all their future plans." 96. Wright, Cavendish's Debates, p. 196. 104. Hansard, Parliamentary History, XVI, 507. He deplored the further erosion of colonial rights: "You relax the principle of vicinage in cases of smuggling and excise; by and by, high treasons will be alleged for taking away the privilege of a jury." He reminded his colleagues of England's past bitter experience with constructive treason under the common law: "It has cost our ancestors, for the laws of high treason, many a long and weary wetting day; many a well-fought field." He drew out the ominous corollary: "Misprisions of treason—no man can define them; no man can say what they are.'' He even extended the earlier argument "that the execution of the project was utterly impossible" and warned prophetically that this policy "is not likely to appease the Americans but to exasperate them" and "precipitate these men into the gulph of high treason." Nevertheless, the address was supported by a 169-to-65 vote, and the king replied, "I shall not fail to give those orders, which you recommend." Thus ended the debate over resurrecting the old Treason Act of Henry VIII to secure trial in England. 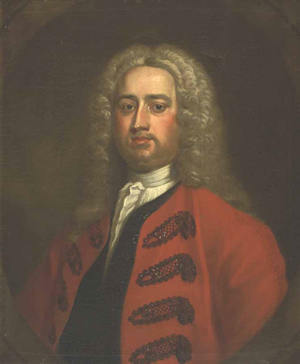 When Governor Bernard of Massachusetts was urged by Lord Barrington to get on with the policy expressed in the Bedford Address, he replied that this could not be executed unless the home government armed him "with some extraordinary power." Hillsborough was quite willing to supply such power by substantive changes in the Massachusetts government, as well as in the government of New York, where Quartering Act riots had taken place. The king, however, was reluctant to begin colonial charter revision. Colonial resistance to the Townshend duties subsided when all of the duties except the tea tax were repealed. Just as the Crown had covered its retreat from the Stamp Act with its blanket assertion of parliamentary supremacy, so too it again counterbalanced its Townshend duties repeal with its retention of the tea tax and its threat of trial in England for treason. That the colonists took this threat very seriously was evidenced by the spirited resolves against the Bedford Address in Virginia and Rhode Island. The fact that the revenue system continued meant that nothing permanent had been resolved despite the seeming quiescence after 1770. 105. Wright, Cavendish's Debates, I, 198-200. 106. Hansard, Parliamentary History, XVI, 510. 107. Lawrence H. Gipson, The Triumphant Empire: The Rumbling of the Coming Storm, 1766-1770, Vol. XI of The British Empire before the American Revolution (New York: Alfred A. Knopf, 1965), pp. 239-41. Suddenly the simmering cauldron boiled over again with the Gaspee attack. Only because the perpetrators were unknown did investigation have to precede prosecution. This was the reason for establishing an inquiry. Neither Hillsborough nor North would have hesitated to send for any accused had their identity been known. Dartmouth might have balked temporarily, but the evidence here is inconclusive. Revision or revocation of Rhode Island's charter had been both recommended and seriously considered, and it would have been greatly facilitated by evidence not just of high treason but of specific traitors. As has been seen, the "great silence" precluded such action, and the Crown was overtaken by events in Massachusetts instead. The third and final stage of colonial resistance and ministerial reaction came with the Boston Tea Party in December 1773. As news of the Tea Party and its attendant circumstances reached England, the British Cabinet determined on January 29, 1774, "to secure the dependence of the colonies on the mother country." On February 4 it agreed to consult the Crown lawyers and ask whether the riots in Boston "do amount to the crime of high treason . . . and what will be the proper and legal method of proceeding against such persons.'' On February 5 Dartmouth sent the attorney general a detailed narrative of the events leading up to the Tea Party. The same day, the ministers met and discussed measures to be taken if the law servants found sufficient grounds for proceeding. They considered issuing a commission "to certain persons" in Massachusetts "to enquire . . . and to apprehend and send over such persons as they shall find to have been guilty . . . with the evidence against them . . . that they may be tried here." Dartmouth was to ask the law servants whether the king could appoint justices of the peace in Massachusetts. On February 9 he sent more details of events in Boston, and on the next day Thurlow and Wedderburn returned their opinion. The Crown lawyers found "that the acts and proceedings . . . do amount to the crime of High Treason." They offered several procedures: either. . . prosecuting them ... in the country ... or arresting them there by the justices of the peace . . . and transmitting them hither to be tried in some county of England ... or ... sending over a warrant of a Secretary of State... to arrest and bring over the offenders to be tried here. 108. Bargar, Lord Dartmouth, p. 78. 109. Donoughue, British Politics, pp. 49-55. They defined each as legal; the most proper should be dictated by circumstances. They specifically named Sam Adams and John Hancock as well as the selectmen of Boston and the House of Representatives, but they concluded "that the state of the evidence ... as it stands ... is scarce sufficient to affect any person with the crime of High Treason." Despite this opinion, Dartmouth wrote to the law servants on February 11 asking about the original ministerial idea, i.e., if the king should "appoint commissioners ... to make inquisition," can he "invest such commissioners with full powers of magistracy ... as such powers are now exercised by the ordinary civil magistrates within the colony"? In reply, Thurlow advised the king to send out a proper person conversant in the law to assist in the execution of a warrant should one be issued. This procedure could apply to any of the three policies already delimited, but the Ministry's idea of establishing a special commission to sit in Massachusetts with the power to hear and to determine had been twice rejected. Thurlow and Wedderburn had not departed from their original opinion of August 10, 1772, that courts of oyer and terminer were not to be created where comparable courts already existed in the colonies. A similar consistency in the matter of insisting upon sufficient evidence before issuing warrants was also shown by the law servants. Together with Dartmouth, they interrogated twelve new witnesses on February 16, and their information went to the Cabinet the same day to be attested before the Privy Council so that warrants could be issued. The next day Dartmouth called nine of the witnesses back for a private examination, and all twelve were told to attend the Privy Council meeting on February 19. At that time the council received the law servants' report, witnesses were examined, and depositions were taken under oath. These depositions were then referred to the law servants. On February 28 the Cabinet met with the law servants attending, and at this meeting Thurlow and Wedderburn "gave their opinion that the charge of High Treason cannot be maintained against any individuals on the ground of the depositions taken at the Council Board on the 19th. 111. Donoughue, British Politics, p. 57. There have been several explanations to account for this decision, but it appears to have been primarily the determination of Thurlow and seems to rest fairly upon the grounds of insufficient evidence. Dartmouth detailed the situation to General Gage in an April letter. The object of the enquiry made here was to have established such a charge against the ringleaders in those violences, as might have enabled His Majesty to have proceeded against them in this Kingdom; it was found however upon the result that it would be difficult (clear and positive as the evidence was with respect to some parts of the proceedings) to establish such a connection between the acts of the body of people, and the destruction of the tea, as to leave no doubt of the propriety and effect of bringing over the persons charged to be tried here. He also enclosed details of the known offenses and suspected offenders and advised that "in this dilemma there seemed to be no other method of proceeding against them but in the ordinary courts of justice within the colony." However, Dartmouth then cautioned Gage that "if. . . the prejudices of the people should appear to you to be such as would in all probability prevent a conviction, however clear and full the evidence might be, in that case it would be better to desist from prosecution." The reason for this was "that an ineffectual attempt would only be triumph to the faction and disgraceful to Government." Clearly both the initiative for and the location of treason prosecutions had passed back across the Atlantic, and the evocation of 35 Henry VIII, c. 2, began to fade. In August, Samuel Dyer was arrested by Gage on a different matter, but he was interrogated by Montagu about the leaders in the Boston riots. This testimony was forwarded to the Admiralty, which turned it over to the American Department. The Crown lawyers again held that since the testimony would not support a charge of treason, the old Tudor statute did not apply. By early 1775, during the debates over North's "conciliatory" policy, the act of Henry VIII was condemned as an attempt to "bring the Americans over here to butcher them in the King's bench." By that time, however, the policy advocated in the Bedford Address of 1769 had become a dead letter. 114. Donoughue, British Politics, pp. 61-62. 115. Ibid., p. 63, n. 2. 116. Chapin, American Law of Treason, p. 20. The end of the road had actually been reached back on February 28, 1774, when the law servants had held out for such a sufficiency of evidence as to make it inoperative. Parenthetically, it may be recalled that Gage, then governor of Massachusetts, was no more successful there. In July he complained to Dartmouth that he had tried to gather evidence, "but tho' I hear of many things against this and that person, yet when I descend to particular points and want people to stand forth in order to bring crimes home to individuals by clear and full evidence, I am at a loss.'' In January 1775 Dartmouth sent Gage additional instructions. This was the "secret letter" that led directly to Lexington and Concord. Besides recommending military action, Dartmouth also advised the seizure and trial of prominent leaders and enclosed the law servants' opinion of December 13, 1774, that the Suffolk Resolves were treasonable. Whatever Gage's primary or even secondary purpose was in marching to Lexington in April, it is clear from his report on the matter that he understood that he had been ordered to arrest John Hancock and Samuel Adams. He carefully explained to Dartmouth that the "disaffected" had received news of the ministerial action before he did, and that the leaders had fled just in time to escape the trap. Had they been taken, they could conceivably have been transported to England for trial for treason according to the old law, but history had taken a very different turn by that time. It will also be recalled that treason prosecutions and the closing of the Port of Boston until the destroyed tea had been paid for had constituted the original reaction of the North Ministry to the Tea Party. No sooner had discussion at the Cabinet level begun, however, than complications emerged. Although the law servants this time were very confident that the Crown could proceed on its own prerogative and relocate the Boston customs, even North had doubts that this should be attempted without parliamentary confirmation. Thus in that pivotal Cabinet meeting of February 19, 1774, he sought "permission to bring in the Boston Port Bill and a bill to alter the constitution of Massachusetts Bay." Even had this not been the case, Parliament unquestionably would have become involved. It had demanded to see the American papers on the Tea Party back in January, and by February 1 Dartmouth had already promised to deliver them to the House of Lords. 117. Chapin, American Law of Treason, pp. 21-22. 118. Donoughue, British Politics, p. 66. This was three days before he had approached the law servants on the feasibility of treason trials. There is one thing I much wish, which is, the punishment of those individuals who have been the ringleaders and forerunners of these mischiefs. Our attention will be continually active in that point. A prosecution has already been ordered against them by His Majesty's servants. I cannot promise any very good effect until this law shall have reached the province. The nexus between treason prosecution and charter revision is crucial. In 1769 Burke suspected, and rightly so, that Hillsborough was raising the issue of treason to facilitate new moves— charter revision in Massachusetts and New York. In 1772 North conceivably accepted the Gaspee inquiry in preference to Sandwich's insistence upon revoking Rhode Island's charter. In 1774 Mansfield possibly drew the Privy Council's attention away from specific prosecutions to general coercion. 120. Donoughue, British Politics, p. 62. There is no reason to doubt that by April, North himself saw no longer a choice but a sequence: for the preferred prosecutions to succeed, the necessary coercion must precede them. The "nature of our law" had precluded his proceeding on insufficient evidence, and the "distance of places" had complicated his reluctance to establish special courts where ordinary ones already existed. I... do profess, testify and declare that I will obey the laws and statutes which the King's Majesty by and with the advice and consent of the Lords spiritual and temporal and Commons of Great Britain in Parliament assembled hath made, or shall make, to bind the colonies in America. In a sense this was a reversion to the earlier, more moderate North policy of dealing with individuals rather than an entire colony. In another sense it was reminiscent of the king's Gaspee proclamation, with both attempting to divide the leaders from their followers. In its most important sense it was the Declaratory Act, in its unqualified form, which had now become the measurement of loyalty. It was a blunt statement of Britain's legislative supremacy to be acknowledged explicitly, an acknowledgment some parliamentarians had cautioned against back in 1766. Such acknowledgment constituted a submission both to all past measures of the British government and to any future policies it might formulate, a submission which Burke had specifically rejected in 1768. One may still question whether or not the parliamentary address to the king declaring Massachusetts in rebellion was indeed "amounting to a declaration of war," as a minority of dissenting lords held, but upon reading the loyalty oath one is entitled to agree with them that it "holds out no substantial offer of redress of grievance." 122. Donoughue, British Politics, p. 247. 123. Hansard, Parliamentary History, XVIII, 296. This protest had been laid down in the House of Lords on February 7. It was addressed to the king and carried the signatures of Richmond, Rockingham, and Camden. In December, Rockingham and Richmond also signed the last futile protest against the Prohibitory Bill, which gave legislative ratification to the king's Proclamation of Rebellion in August and completed the blockade of the colonies. They fully appreciated that the only recourse for the colonists now would be independence, "because this Bill, by considering the colonies in America as a foreign nation, and declaring war on them in that character, has a direct tendency to effect an entire, and (we fear) permanent separation between the two capital parts of this empire." Ibid., p. 1087. The suggestion here is not that the sequel of events between the enactment of the Coercive Acts and the "clash of resounding arms" on Lexington Green was inevitable. It is simply that the challenge hurled down that morning, "Disperse, ye rebels," and the musket fire reply, had been resolved in theory some time before this. Nor is it to be suggested that events between April 19, 1775, and July 4, 1776, were irreversible. Simply stated, there was both a logical and a legal inescapability between these two dates. Those who joined Washington's Continental army became the first American citizens, professing a new allegiance and accepting the Articles of War, which delimited treasonable acts and was approved by the Continental Congress in June 1775. Such men were under the ban of the Royal Proclamation of Rebellion by August 1775. Washington's reception of command of the Continental army at Cambridge constituted his de facto declaration of independence. He ensured that his men would be treated as prisoners of war rather than as criminals if captured by threatening retaliation against British military captives in his letter to Gage of August 1775. The release of Ethan Allen that December and of Henry Laurens after Yorktown proved the effectiveness of that threat. The argument over the extent of parliamentary supremacy had long since been given over to arbitration by arms. Evidence suggests that the epithet "First Blow for Freedom" may fit the Gaspee affair after all. It certainly was sui generis. Faced with colonial resistance to imperial reorganization, Britain had three choices: to comply with it, to correct conditions which permitted it, or to coerce it. The decisions that Britain made in crises were a mixture of these alternatives. Repeal of the Stamp Act was compliance with the opposition, but it also contained the element of coercion in the thrust of the Declaratory Act. The Intolerable Acts included the Boston Port Act, pure coercion, and the Massachusetts Government Act, looking toward correction. 124. Chapin, American Law of Treason, pp. 29-30. After the Gaspee attack Britain complied with the rules of evidence, corrected a fault in the imperial machinery by resurrecting the Treason Act of Henry VIII, and attempted to coerce the attackers by prosecuting them to the limit of the law of constructive treason. This ultimate coercion, which led ineluctably to a halter at Tybum Gate Prison, was only intention at the time of the Townshend duty demonstrations and became only interim, anticipating collective measures, right after the Tea Party. After the Gaspee attack it was initiated for the first time and was to have been fully implemented. It was to have ensured the end of resistance. It had no exact counterpart during the entire thirteen turbulent years between 1763 and 1776. The complete failure of Britain's Gaspee policy demonstrated a great deal. This analysis article has been stolen wholesale from the Gaspee Days Committee virtual archives. It proved that this approach was impossible to execute, just as its critics had predicted from the outset. It proved how alienated the colonists had become over the manner of revenue-law enforcement. It proved how determined they were to maintain their rights to jury trials in the vicinage. It proved that not even an enormous reward could ensure the success of this new procedure. It proved that leaders and followers—indeed, one colony and another—could not be as easily divided as had first been imagined. It proved that the threat of treason trials could produce more centripetal than centrifugal effects. It proved that exhuming the ghost of a tyrannical Tudor king to take a case away from colonial authorities could provoke these authorities to concealment, collusion, and conspiracy. Americans have often been accused of reclaiming a seventeenth-century construction of the British Constitution to support their argument over the nature of the British Empire in the eighteenth century. With equal consistency Great Britain could be indicted for resurrecting a sixteenth-century legal convenience to suppress dissent with a fourteenth-century treason law of Edward III. Consider the matter another way. Suppose the treason-trial-in-England approach had succeeded in 1773; what might reasonably be speculated in that case? What was the import of Hopkins's vowing that he would never permit a single suspect to be taken from the colony? Why was Stiles so certain that a general colonial congress would surely have followed the transportation of one accused person? 126. Stiles, Diary, I, 349. How could Oliver have been so certain that successful prosecution would have moved up the outbreak of the war by two years? What were nearly sixty-thousand Rhode Islanders saying to the Crown when not a single creditable state's witness could be found? Why were there requests for exact information from other colonies even after the Tea Party? Could the continuing arguments over conflicting jurisdictions have been resolved short of new parliamentary action? Indeed, could the Crown have successfully prosecuted for high treason without definitively establishing its absolute supremacy over its colonies? The old Treason Act of Henry VIII may have been rescued from oblivion to circumvent colonial courts, thus making the nature of the crime fit the convenience of the procedure. This was reluctantly admitted by the Ministry. It may have been revitalized to intimidate colonial resistance. This was acknowledged by the Ministry only after the attack of the loyal opposition. It may have been reapplied to silence the opposition in the colonies. This fear was expressed at the start. For whatever reason it was reinstated, it had the effect of dissolving all subsidiary arguments, of elevating tensions to the breaking point, and of ensuring one last confrontation. Differences of opinion on both sides of the Atlantic over the nature of the British Empire may have been impressive before, but now they had become irreconcilable within that empire. Would the colonists have been any more submissive over the fundamental question of their place in the empire in 1773 than they were in 1775? Would a policy of individual prosecution have succeeded any more than a policy of charter revision in avoiding a final resolution of the dispute? Did not Great Britain's actions after the Tea Party indicate that the judgment had already been made? The reader may decide these matters for himself. This is possible two centuries later because Judge Staples assiduously collected and fittingly preserved these essential documents on the pivotal Gaspee affair. In another of his histories, Staples acknowledged "a decided preference for facts" and explained that his object would be accomplished if he succeeded "in arousing attention to the facts." Whatever analyses, conjectures, or musings the reader brings to these papers, he cannot fail to agree that the good judge has more than accomplished the important task that he set before himself well over a century ago. 128. William R. Staples, Annals of the Town of Providence (Providence: Knowles and Vose, 1843), p. vi.